1st Annual Purple Martin Community Unity Weekend April 13-14th | GLOBAL SHYNE INC. 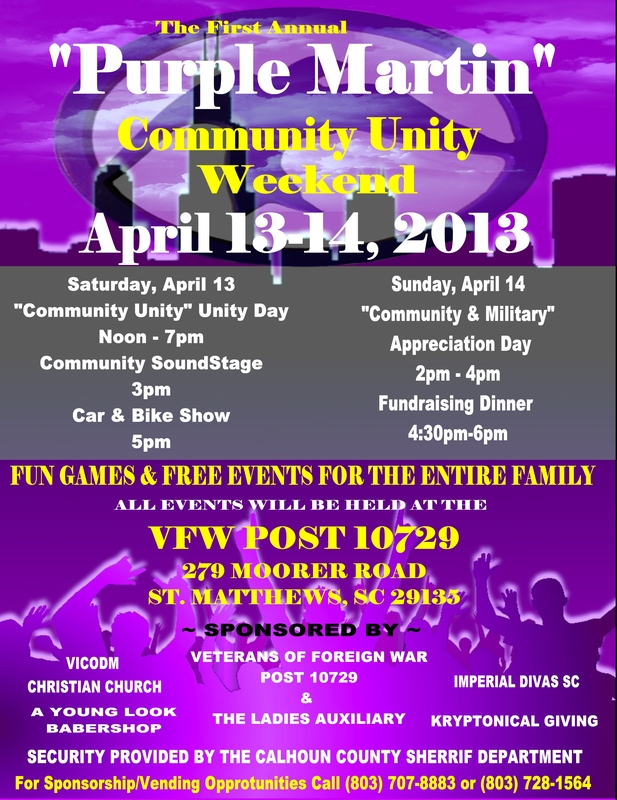 The Purple Martin Community Unity Weekend will be a weekend of unity, support and recognition for the outstanding service of the citizens of Calhoun County, SC that have positively impacted the community through service of any type (community, civil, military, medical, economical, environmental, etc…). On Saturday April 13th, 2013 we will host a day of unity through events that will encourage citizens to positively serve the “Purple Martin Community”. We will also provide fun filled events for the entire family such as the Bounce Castles, Face Painting, Balloon Animal Making, Car & Bike Show, Local Talent Performances, Community Bingo, and more! On Sunday, April 14th, 2013 there will be a “Serving Those Who Served” Community & Military Appreciation Ceremony, and a “Purple Martin Community Unity” Fundraising Dinner. Tickets for the Fundraising Dinner are available for $10.00. Please visit www.facebook.com/purplemartincommunity for updates and more information.